Peugeots new look 406 range of executive saloons and estate cars goes on sale today (Monday April 1999). Originally launched in 1996, the multi-award winning 406 has been extensively restyled by Pininfarina and benefits from over one thousand engineering changes including two new engines and improved levels of safety. Ranging from £14,295 to £24,100 on the road, there is virtually no change in price across the range. The restyling of the 406 reflects a desire to give the car a greater presence through added value without losing the elegance of the original design. It mainly concerns the front of the saloon and estate and the rear of the saloon. The 406 coupé is not affected externally. At the front, the bonnet now has more pronounced ribs which link with the elongated, totally smooth glass headlights. Chrome and black trim decorates the body coloured bumper and a new-shape, chrome lion badge sits on the centre of a honeycomb grill. At the side, a distinctive contour line begins at the headlights and runs round the rear wings into the painted section of the new "ruby" red rear light clusters and extends along the panel of the boot lid. The boot lid is now convex in shape and offers more boot space. On the estate, the bumper has been redesigned and the tailgate has a chromed lower edge. All 406 models are enhanced by new wheel trims or new alloy wheels. The interior ambience has been improved by a new dashboard fitted with chrome-encircled dials and a redesigned central façade containing a LCD screen and more practical radio ventilation controls. The new four-spoke steering wheel has a central pad, which now contains the horn control. The centre console and the door casings have been redesigned to offer greater comfort and ease of use and the seats have been reshaped and trimmed with new materials. There are six specification levels - L, LX, GLX, GTX, Executive and V6. The new 406 sees the launch of a new generation of petrol engines called EW, the first of which has a capacity of 1997 cm3, 16 valves and power of 99 kW (137bhp) at 6000 rpm. Thanks to its alloy crankcase, overall weight saving and to major reductions in internal friction, the performance and consumption of a 406 saloon with manual transmission have improved perceptibly. The mixed cycle consumption has been reduced by 10% to 33.9mpg over the superseded XU10 J4R engine and performance has developed in absolute terms with a top speed of 129 mph and 0 to 62 mph in 10.8 seconds. The driving performance, although more subjective, is significantly improved thanks to the increase in torque at low engine speeds (190 Nm at 4100 rpm instead of 180 Nm at 4200 rpm in the XU10 J4R). The improvement in controls, in particular the hydraulic clutch and the gear selection, means these are gentler and more precise. Improved versions of the 1.8 litre (112bhp) and the V6 3.0 litre (194bhp) complete the range of petrol engines available. In Turbo Diesel form, the first generation HDi DW10 ATED direct injection Common Rail engine appeared on the 406 in the autumn and has returned on the new 406 with a new feature designed to perfect the acoustic and vibratory comfort. It has a double flywheel with damper which allows smooth running even at very low speeds (down to around 1000 rpm) while retaining the progressive acceleration of the HDi engine. This engine develops a maximum power of 80 kW (110bhp) at 4000 rpm and a maximum torque of 250 Nm (26 mkg) at 1750 rpm. Note that the efficiency of this engine allows a significant reduction in CO2 emissions to 150 g/km and in fuel consumption (mixed cycle 51.3 mpg). It also develops high torque at low engine speeds and a reduced sound level. On the new 406, this engine is now joined by another HDi version with the same capacity of 1997 cm3 but giving 66 kW (90bhp) at 4000 rpm. This engine is intended for the base models of the 406 range while offering the full intelligence of the high pressure common rail with in particular the reduced mean fuel consumption. Without an intake air exchanger, it nonetheless develops a power of 66 kW (90 bhp) at 4000 rpm and in particular a torque of 205 Nm (21.4 mkg) at 1900 rpm. The torque figures available at low speed improve the driving pleasure, and as a bonus this engine emits only 154 g/km CO2 compared with 181 g/km for its predecessor. The mixed cycle fuel consumption amounts to 50.5mpg compared with 40.9mpg before. This engine replaces the indirect injection XUD9 BTF diesel and means that the new 406 Turbo Diesel range is powered exclusively by high pressure direct injection HDi. Thanks to these new engines, the 406 range benefits from significant technological advances offering a reduction in consumption and emissions coupled with improved driving behaviour. The 406 range models are fitted with 5-speed manual gearboxes or 4-speed automatic boxes with the electronic control system known as "auto-adaptive". The suspension and wheels of the 406 have undergone little modification. The front is fitted with pseudo-MacPherson strut suspension with decoupled anti-roll bars and the rear has a multilink system for strict control of the wheel plane under any conditions, thanks to the four arms per unit. The damping is improved by the general use of pressurised dampers (3 bar) which offer greater heat resistance, and models previously fitted with 14" wheels now have 15" wheels shod in 195/65 R15H tyres which offer a low rolling resistance. The 406 versions powered by the 6 cylinder ES9 J4 engine are fitted with 205/60 R15V tyres and the coupé with the same engine has the Michelin MXM 215/55 R16W. In general the weight savings achieved with the new engines (EW - DW) have allowed a change to the various spring and damper rates for enhanced driving comfort without affecting behaviour. All 406s are fitted with ABS and electronic braking distribution as standard. This system not only divides the braking force between the front and rear axles but during braking on corners, divides the force between the two wheels on the rear axle to benefit the outer wheel which carries the most load. Throughout the 406 range, the rack steering is assisted by an integrated hydraulic ram. On the base models, conventional constant flow power steering is used but the mid-range variants have modulated assistance (variable flow as a function of engine speed) and the top range models variable assistance as a function of the vehicle speed. All 406s have a four-spoke steering wheel in a new design which is adjustable in height over 35 mm and in depth over 27 mm. The horn is now controlled by pressing the padded centre of the steering wheel in the same way as the 206. Strength and safety are strong attractions for the customer, both for reassurance and durability. Already well armed by its structural design and high level of active safety, the new 406 offers new benefits intended to increase its strength and the protection of its occupants. The new generation engines (EW and DW) are firstly positioned further away from the cab thanks to their straighter alignment, thus releasing more absorption space in case of impact. In the same spirit, the structural developments are intended to improve behaviour at the front foot well thanks to the redesigned inner wings and padding which is arranged in the lower part of the dashboard and a retractable cushion between the dashboard and the cross member. Passive safety has also increased by the introduction of low calibration safety belts which, in conjunction with the new optimised airbags with programmed retention (high output for driver: 45 litres, and tapered for passenger: 90 litres) bring a significant gain in protection for driver and passenger, who also benefit from two double side airbags (head and thorax). The passenger airbag can now be locked via a key switch, so it is now possible to fit a rear-facing child seat on the front seat. Ahead of European standards, the 406 also has improved head restraints and fitted a third rear head restraint in the saloon, as in the estates. All models will now have five head restraints. Finally the rearrangement of electrical equipment and the improvement in practicality have led to the design of a more visible and isolated hazard warning button which is more easily identifiable. The same applies to the electric window buttons arranged on the doors and a multi-function display which can indicate an open door for example. Active safety is at a high level thanks to the high performance suspension with forged steel wishbones at the front and multilink units at the rear, and is further enhanced by an improvement in tyre rating, now 195/65 R15 on 6" wide wheels right from the base models. With ABS braking combined with electronic division of the braking force, which improves deceleration behaviour in particular on cornering, the use of the new tyres also helps reduce the stopping distance on the models concerned. Comfort is a prime motivator for a present 406 customer. This growing expectation, synonymous with well-being and a feeling at home, is further accentuated on the new 406 with a wider range of vertical comfort, postural comfort and ergonomics, practicality, acoustic and vibratory comfort, driving aids and a more subjective dimension of visual and tactile comfort. Renowned for its ride comfort and excellent rolling behaviour, the 406 continues to make progress with the use of pressurised valve dampers which improve vertical control at low speeds in particular. The ergonomic changes to the new 406 improve the position of the body in relation to the internal environment of the car and so create a more relaxed driving experience and preserve onboard tranquillity. As seats represent a major component in postural comfort, the 406 in particular offers textile seating in a more geometric design which offers greater leg support without affecting the comfort of smaller drivers. The adjustment options have now been extended to include the driver's seat height on all models, a seat base adjustment on almost 80% of models and integral lumbar support on all seat backrests. In addition, the SV version is fitted as standard with electric controlled seats which are further enhanced by memory units and leather trim. Front passengers in the new seats now have access to a new arm rest with totally redesigned ergonomics which offers greater support for the elbow (+ 5 mm), an extra length of 5 mm and a more comfortable height (+ 40 mm). 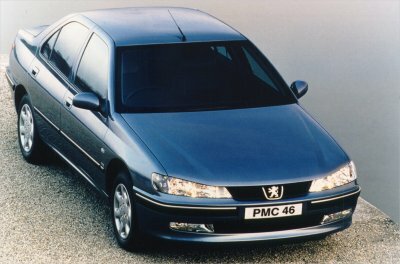 Traditionally faithful to the 3 box saloon for its balance of style and character, Peugeot have designed the 406 right from the first generation with modular rear seating able to expand the luggage space when required and offer a practicality close to that of a 2 box design. The new design of the rear parcel shelf panel enhances this practical dimension and increases the useful height of the boot by 40 mm, to take two large rigid suitcases on top of each other or standing upright. This new panel design however does not detract from the original features including sunblind, storage compartment and speakers. On this occasion, the rear seat back locking system has been redesigned. These are now self-locking and isolate the boot. The fold down is now controlled by two handles located below the parcel shelf, marked in red and far more accessible as located in the entrance to the boot. Life on board is also improved in the new 406 by new features intended to assist the driver and passengers. Hence the new steering wheel with its magnesium frame is now lighter and has the horn push located in the centre, activated from all parts of the centre pad. The centre console now has a noise damping carpet at the front and two cup holders with waterproof base in the rear. The rearrangement of the electrical architecture now includes a multi-function display with information relating to time, date or radio, external temperature and the on-board computer. Also, because of the extension in service intervals, it is now possible to monitor firstly the oil level before starting the engine, on an indicator located in the dashboard, and secondly the distance to be covered before the next service. Comfort and practicality are also expressed in the range of new equipment available and the wider variety. The climate control system with automatic adjustment of temperature and air flow has evolved with a control panel and LCD screen which are now easier to understand. Climate control is fitted as standard from the GLX level instead of the previous non-regulated air conditioning. The air recycling feature is now activated by an assisted push-button. As another innovation, the on-board electrical equipment on the 406 has been re-arranged to offer greater user comfort. The Intelligent Control Box (BSI) now forms part of a multiplexed network. This connects the dashboard, the onboard navigation and the car radio on the LCD display and the CD changer. All these systems communicate with each other more effectively than before. The new dashboard with its chromed round dials and redesigned graphics now incorporates a service indicator and oil level indicator on all models. The dashboard lighting rheostat for the display is on the left of the dashboard and, with the bulbs lit, gives the intensity of daylight. All lit controls have the same intensity. The interior and door sill lighting now has a 10 second delay. The audible indicators for flashers, open door, lights on and anti-theft key come from a small speaker fitted in the dashboard. The two comfort features of practical nature taken from the coupé pack are now offered on the top range 406. These are the external door mirrors which fold back electrically against the bodywork and the interior electro-chromed day/night rearview mirror which automatically adapts the mirror tint to the light conditions to avoid any dazzling. The new audio units fitted to the new 406 all have steering wheel controls and remote display. One has a volume variation as a function of speed and its performance can be increased further with a JBL hi-fi system fitted with separate amplifier. With the JBL hi-fi system, there are two tweeters at the front with two mid-range tweeters, two woofers in the front doors and four coaxial speakers (two woofer-tweeters) on the rear parcel shelf. At the user's request, the display indicates the settings of the various speakers. Comfort and ease of use are reflected even more clearly in the on-board navigation system offered on the new 406. This system mainly comprises a CD-Rom reader in the right wall of the boot and a GPS antenna located beneath the dashboard visor. The guidance system uses a monochrome graphic display and voice synthesizer for the manoeuvres required. The guidance system is selected very simply using the infrared remote control. 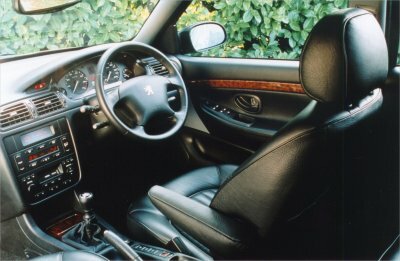 Seated inside the car, the driver will quickly notice the change in interior ambience. The emphasis on comfort and ergonomics is also expressed in the visual, tactile and acoustic perception. The seat shape is more geometric with longer metal inserts which add to the shaping of the seat base improving comfort and support. This type of seat also allows the use of two fabrics (main fabric with quiet design and harmonising trim) which follow the shaping of the seat. From the base level in L trim, the seating is finished in textile material. A dry touch, high quality woven fabric has been selected. Now covering the seat sides and backs too, this gives a visual and tactile impression of quality. With its darker tones, it is more "resistant" to families with young children. In the mid-range, the fabric used is based on the same principle of cut velours and only the knee rest and storage pouch are made of vinyl. At the top of the range, a different central velour with very subtle patterning is used to trim the electric controlled seats. A Tungsten grey or Oyster leather trim is available at the top of the range or as a tailor-made option, retained for class and comfort. The improvement in comfort and practicality of the arm rests is accompanied by new stronger, high quality textile materials. In the leather trim version, the door panels are enhanced by a piqué leather panel on the 4 mm padding giving a softer touch. The interior ambience, with its air of comfort and modernity, also benefits from attention to detail such as a chromed handbrake button, chrome-plated air distributor controls and a softer gear lever knob. The current dashboards have been refinished in the new minimalist style with no obvious passenger airbag cover as this is now integrated and operates by tearing the covering. The nuances of the wooden trim dashboard have been subtly altered with a new walnut insert which is slightly lighter and warmer. The glove box on the dashboard benefits from comfort details in the form of a slow opening device. A major factor in on-board comfort is the level of noise experienced inside the car. The new HDi diesel engines benefit from injection technology which allows a reduction in engine noise and the double flywheel of the HDi 80 kW engine further reduces noise and vibration on pick-up from low speed. The specific HDi acoustic cover and new bonnet sound insulation of glass fibre (fitted to all petrol and diesel versions) guarantee a perfect sound level of the cars. Also numerous technical modifications intended to reduce or even totally suppress mechanical noise, vibration and harshness have been made on the new 406. In particular on the rear axle, the use of the lower ball joint from the coupé has the advantage of improving the elastic articulation and reducing the friction which generates noise. To summarise, the new 406 reinforces the investment which made the original 406 a success by the addition of features which seek to improve modernity, safety and standing. The latter is reflected as much by the new exterior styling and interior finish as by the performance and equipment levels offered.